There is great variation in views on and treatment of minorities such as gay men across the world. We are the first to pinpoint what features of societies are beneficial to gay men’s quality of life by using a unique new cross-country dataset covering 110 countries, the Gay Happiness Index. It covers how gays perceive public opinion about them, how they experience behavior towards them and how satisfied they are with their lives. Our study is based on the premise that it is important to look at minority-specific effects of policies and institutions and not solely at the effects for the average citizen, as well as the transmission mechanisms through which policies and institutions affect life satisfaction. We find that factors such as equal legal rights for gay people, GDP per capita, democracy and globalization relate positively to the quality of life of gay men, primarily by shaping public opinion and behavior in a pro-gay direction. 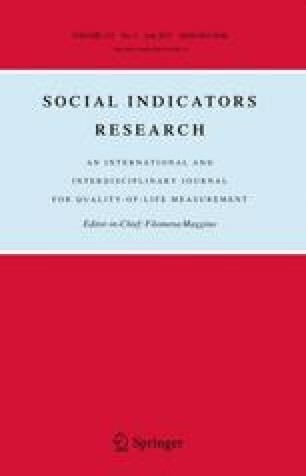 Religion (the shares of Muslims and Orthodox Christians) and living in a post-communist country tend to relate negatively to our quality of life indicators. Most of these factors have been shown to matter for the well-being of people in general as well, which may be taken to suggest that gay people benefit from being included in society—legally, socially and economically—on the same terms as others. The online version of this article (doi: 10.1007/s11205-016-1340-3) contains supplementary material, which is available to authorized users. The authors wish to thank Andreas Bergh, Jerg Gutmann, Martin Rode, Reto Odermatt and participants of the 17th Danish Public Choice Workshop (Copenhagen, 2016), the Public Choice Society conference (Fort Lauderdale, 2016) and the European Public Choice Society meeting (Freiburg, 2016) for helpful comments and the Swedish Research Council (Berggren and Nilsson), Torsten Söderberg’s Foundation (Berggren and Nilsson), the Czech Science Foundation (Grant 16-19934S) (Berggren and Nilsson) and the Jan Wallander and Tom Hedelius Foundation (Bjørnskov) for financial support. Tables 5 and 6 report estimates from which Fig. 4 is constructed. Alexander, A. C., Inglehart, R., & Welzel, C. (2015). Emancipating sexuality: Breakthroughs into a bulwark of tradition. Social Indicators Research. doi: 10.1007/s11205-015-1137-9. American Psychological Association. (2008). Sexual orientation and homosexuality. http://web.archive.org/web/20130808032050/http://www.apa.org/helpcenter/sexual-orientation.aspx. Gallup. (2014). Gallup world poll. www.gallup.com/consulting/worldpoll/24046/About.aspx. Gates, G. J. (2011). How many people are lesbian, gay, bisexual and transgender? Report. Los Angeles: The Williams Institute, UCLA. http://escholarship.org/uc/item/09h684x2. KOF. (2015). KOF index of globalization. http://globalization.kof.ethz.ch/. Lemke, R., Tornow, T., & PlanetRomeo.com (2015). Gay happiness monitor—Results overview from a global survey on perceived gay-related public opinion and gay well-being. Report. Mainz: Johannes Gutenberg University. www.planetromeo.com/wp-content/uploads/2015/05/GAY_HAPPINESS_MONITOR_2015.pdf. World Bank. (2015). World development indicators. http://data.worldbank.org/data-catalog/world-development-indicators. World Values Survey (2015). Online database. www.worldvaluessurvey.org.